Like this handy work I created for my holistic living and beauty blog? 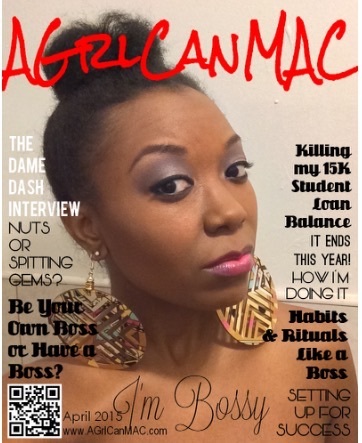 I created this “magazine cover” of sorts with no fancy software like Adobe InDesign because I cant afford it right now. LOL. Forced me to get creative and I like what I came up with. Lots of great things going on at my blog, AGrlCanMAC. This cover highlights 4 posts to drop this month. This month’s theme is “I’m Bossy” and is all about being a bossy chick! You can visit the site at www.agrlcanmac.com to read on!